Taking selfies and talking inequality, has Janet Yellen gone too far? One recent brisk morning in the nation’s capital, about 30 community leaders and workers from around the country, all clad in matching green T-shirts, posed for a group photo on Constitution Ave. Ten guards huddled at the top of the walkway separating them from the Federal Reserve. The workers weren’t protesting. They weren’t sightseeing. They were there to meet Janet Yellen. “That’s a big deal,” said former Fed vice chair Alan Blinder. Friday marked the third time in the past month that Yellen has been in the public eye for engaging with the public, or at least with economic issues much more on their minds than, say, quantitative easing. First, it was her speech at a conference on inequality organized by the Boston Federal Reserve. On that same trip, she met with the jobless at a nearby community center. And then, she posed for selfies. The string of incidents has raised questions about the public face of the Fed, and when it’s appropriate for Yellen, an unelected government official with enormous power, to inject herself into public debates that may have political overtones. Yellen certainly doesn’t want to be a politician, said Alan Blinder, vice chair of the Fed under Bill Clinton. But making those off-the-cuff remarks is an “occupational hazard” of the position, he added, especially when testifying in front of lawmakers. Some chairs have handled it better than others, and both Blinder and Strain agree that Yellen’s comments about inequality were slight as indiscretions come. Alan Greenspan was famous for weighing into policy debates too freely, as when he endorsed George W. Bush’s plan to privatize Social Security in 2005. That behavior inspired Ben Bernanke to shy away from any incursions into the public dialogue unrelated to monetary policy. Bridging the gap between the public dialogue and what’s arguably the most powerful economic institution in the world is exactly what Yellen has been doing. While her remarks about inequality have sparked the most controversy, her invitation to a coalition of community organizers, labor leaders, low-wage workers, faith leaders and liberal economists is the farthest step she’s taken toward involving the public in the Fed and its policies. She didn’t just meet the “Fed Up” campaign, as they call themselves, in a spare conference room. They sat in the inner sanctum of one of the most cloistered agency’s of the U.S. government — the board of governors meeting room, where the Federal Open Market Committee meets in private to decide monetary policy. If the economic news is good, why did voters say it’s bad? Fed Up’s tagline — “What recovery?” — illustrates the disconnect between the two-thirds of voters who told exit pollsters earlier this month that the economy is getting worse and headline economic figures that are growing stronger. Unemployment is now as low as it was before the recession. But wages are barely keeping pace with inflation, while unemployment for some demographics and geographic regions remains much higher than the average. Nationally, African Americans were unemployed at a rate of 10.9 percent in October. In Atlanta, the unemployment rate for blacks is nearly 14 percent, according to an analysis by the Economic Policy Institute, one of the parties to the Fed Up campaign. Workers didn’t travel to Washington to protest Yellen, said Amador Rivas, of Harlem; they just wanted her to hear what’s happening on the ground. Jean Andre echoed those remarks. Andre, a member of New York Communities for Change, used to do locations support in the film industry. “You know, one of those names at the end of the movie that no one reads,” he said. He lived a middle-class lifestyle. But after the financial crash, he lost his home and struggled to find a full-time job to pay for a mortgage modification. 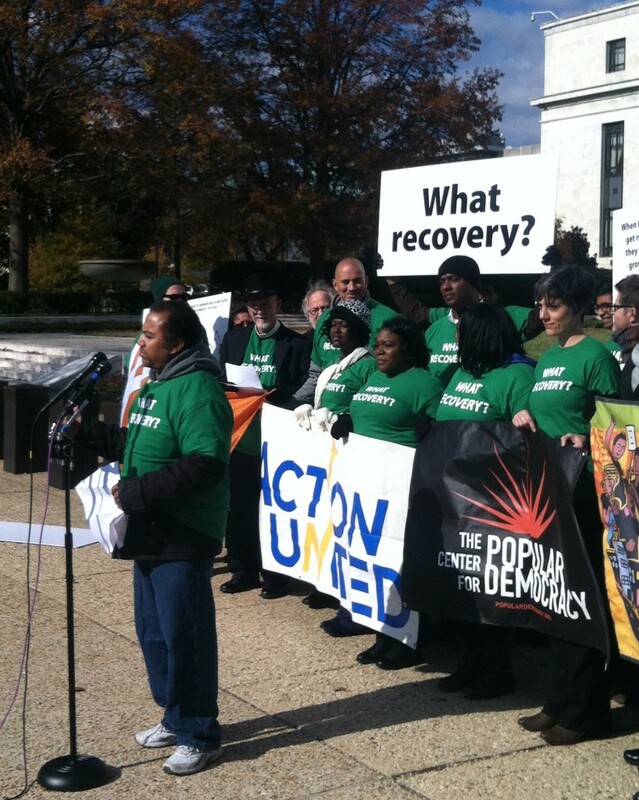 Jean Andre, a member of New York Communities for Change, speaks at an Oct. 14 press conference before Fed Up’s meeting with Yellen. Photo by Simone Pathe. To some on the right, though, Yellen’s meeting looked like it was going beyond a simple meet-and-greet with the public. American Principles in Action blasted her for discussing monetary policy “with representatives of an extreme political view,” and requested a similar meeting for a chance to express their concerns with low interest rates. Fed Up does have an agenda when it comes to monetary policy: they want the Fed to keep interest rates low to stimulate jobs and, they argue, higher wages. They’d also like the Fed to buy municipal bonds as a form of lending to cities and states. “The Fed is too important of an institution to be insulated from the voices and perspectives of working families,” said Ady Barkan, an attorney at the Coalition for Popular Democracy, the group that organized the meeting. 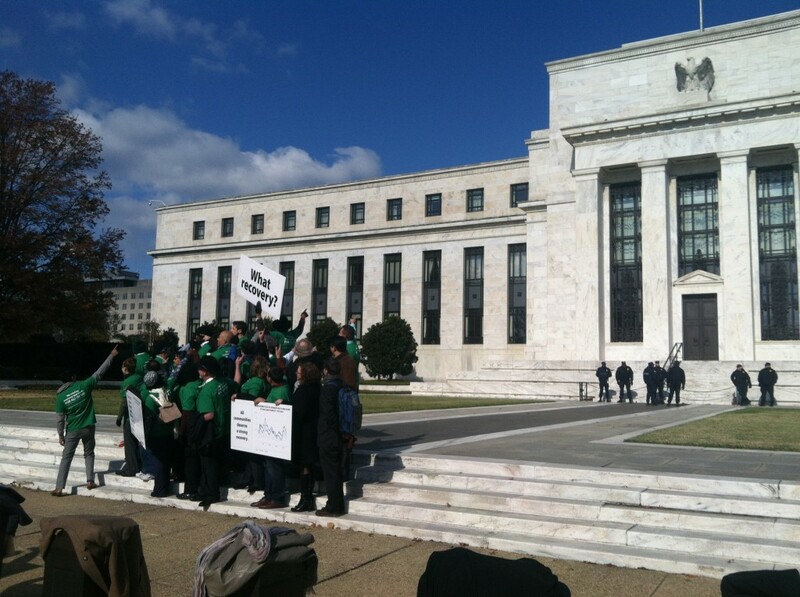 The “Fed Up” campaign gathers for an Oct. 14 press conference outside the Federal Reserve before meeting with Chair Janet Yellen. Photo by Simone Pathe. The central bank has no control over wages, except in the sense that wages typically rise in a tighter labor market, said Blinder. Holding short-term interest rates low is supposed to boost employment, and it has — unemployment has dropped from above 10 percent to below 6 percent — but so far, that’s done little for wages. As for buying municipal bonds to lend to cities and states in need, Blinder doesn’t think that’s the Fed’s business, even if it does have the legal authority to do so. Its dual mandate to maintain full employment and stable prices is about national economic policy, he said, and there’s no way it would be able to choose which states’ bonds to buy. Likewise, the Fed has no policy tools to directly address economic inequality. That’s why Yellen’s Oct. 17 speech, more than anything else, has left Blinder, a close friend, and Strain, who still thinks she’ll “make a great chair,” feeling uneasy. Of course, the Fed isn’t totally removed from the debate over inequality. The central bank conducts research on the subject as an economic phenomenon, and the Boston Fed organized the entire October conference at which Yellen spoke around the topic. That power is precisely why Blinder and Strain agree that the Federal Reserve must be insulated from politics. Talking to labor, community leaders and Wall Street is important, said Blinder, but the transparency for which Bernanke, and now Yellen, has been lauded is about monetary policy, not taxes or inequality. If high inflation is not here yet, why should the Fed change course? To Strain and others on the right, Yellen sounded far too Democratic in her concerns about inequality, as she did when she alluded to universal pre-k, another policy priority often associated with the Democratic Party. Did Yellen betray herself as too blue? Richard Reeves, a fellow at the Brookings Institution, doesn’t think so. The substance of Yellen’s speech offered more to conservatives, he wrote, particularly her acknowledgement of business ownership and inherited wealth as “building blocks” of opportunity in the United States. For Fed Up organizers, though, Yellen’s meeting with them last Friday is not a sign she’s identifying with either party, but that the Fed can be, in the words of the Kansas City Rev. Stanley Runnels, of Communities Creating Opportunity, “an unconventional source of hope” for millions of Americans. 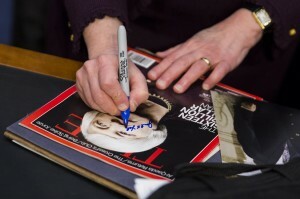 Left: Federal Reserve Chair Janet Yellen signs a copy of Time Magazine while testifying on Capitol Hill earlier this year. Photo by Drew Angerer/Getty Images.